Synopsis Running to nearly 1,300 pages this magnum opus is almost certainly the most extensive book ever written on bowls - the collection of the data alone involving the compiler in writing 15,000 personal letters. The first part of the book (374 pages) provides biographies of leading players and officials by country, followed by a section on the history and other aspects of national associations. The bulk of the book (595 pages) is devoted to information on bowling associations and individual clubs - typically listing main officers, address, date of foundation, cost of subscription, club colours, and oldest and longest serving members. A brief chapter on indoor bowls precedes the final section entitled 'Miscellany of Additional Information' - arguably the most fascinating part of this work. 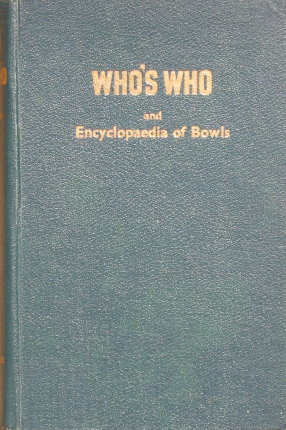 Among the 50 or so subjects, the section on books on bowls provided basic information on the majority of this site's pre-1959 titles. Other topics include such diverse issues as etiquette and courtesy in bowls, left-handed players, measuring and measuring devices, and bowling songs. All in all, a monumental undertaking, and one unlikely to ever be repeated.